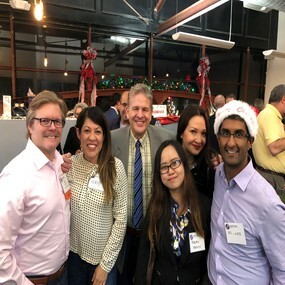 Nov. 2018: UHD Business students attend Australian American Chamber Sundowners Networking event at Platypus Brewery. UHD Marilyn Davies College of Business students have been making valuable connections during the Fall 2018 semester with companies and business professionals at networking events with members the Australian American Chamber of Commerce Houston (AACC). Greg Foley, an Australian American Chamber of Commerce board member, hosts networking workshop for business students. Students receive a 50 percent discount on membership with the AACC which gives them full access to the company directory, free entry into the sundowners networking event, discounts on conference and special events. The Australian American Chamber of Commerce has supported UHD Marilyn Davies College of Business in numerous ways. The College of Business Career Center has been able to leverage our partnership with the AACC to secure five internships for students at OCS Group, an Australian company. Most recently, an AACC board member hosted a “How to Network” workshop for business students on campus in advance of an AACC networking event where students could put the tips & advice into practice. AACC board member, Bruce Rutherford, said the value of networking for college students is invaluable. “The networking value of the AACC for students may be even greater than that for established business people,” said Rutherford. “AACC members can point a student to the right industry or the specific job opening that is right for them. Students who know exactly what they want can use the AACC networking opportunity to seek jobs, internships, advice and referrals. The intellectual events on business issues sponsored by the AACC are marvelous networking and learning opportunities. The AACC is a great opportunity to “never stop learning” and it is just plain fun,” said Rutherford. The AACC’s continued support of our business students led UHD to become a Bronze level sponsor for the Australian American Chamber of Commerce. This is a great milestone on both sides, as UHD is the first education institution to sponsor the chamber. AACC board member, Amy Conacher said the sponsorship between AACC and the College of Business is very exciting! The partnership with AACC allows our students access to Chamber members from all over the globe who represent companies in a variety of industries from oil & gas to medical, government, real estate, finance, hospitality, travel, health, IT, logistics, sports and more. Click to learn more about the Australian American Chamber of Commerce Houston.